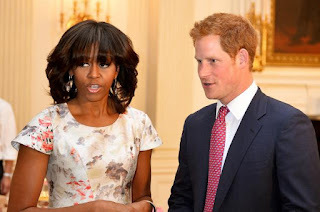 DianeClehane.com: THE ROYAL WATCH: PRINCE HARRY IS HERE! His Royal Hotness, also known as Prince Harry, arrived in the states (he flew commercial!) today for a week long whirlwind tour where he will promote Britain, raise money for charitable causes, support veterans -- and set hundreds of hearts aflutter. The 'spare' to the heir's trip to the U.S. has female fans from Connecticut to Colorado swooning over the 28 year-old prince. Today, he surprised military moms and grandmothers when he stopped in unannounced at a tea party hosted by First Lady Michelle Obama and Dr. Jill Biden for military families. He stayed for several minutes talking at length to the children at the event displaying the easy charm and accessible nature that made his mother, the late Princess Diana, an international superstar. "There were actual squeals of delight when he entered the room," according to one source I spoke to. "He is very much like his mother that way. Everyone loves him and every eye in the room was on him the entire time." 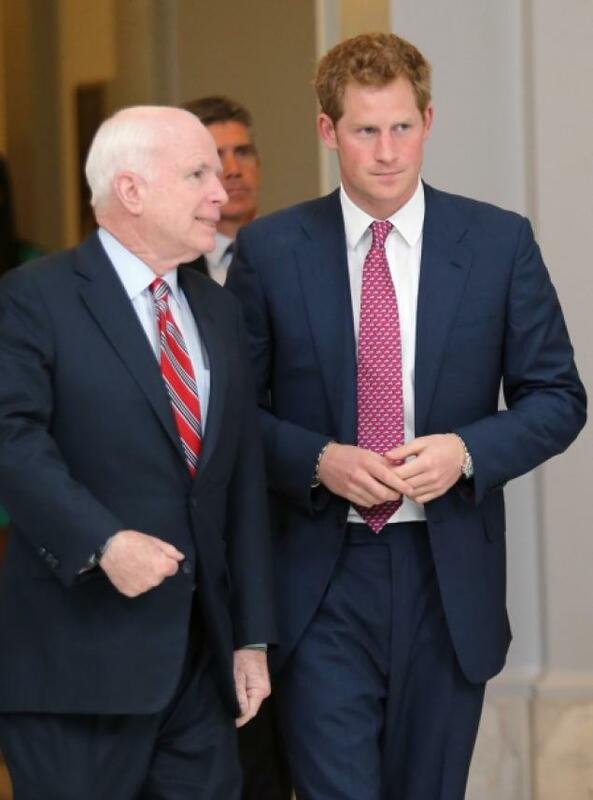 Harry also met with Senator John McCain while attending a photo exhibit organized by the British nonprofit HALO Trust, whose mission is to educate the public about the presence and toll of unexploded land mines, a cause that Princess Diana also supported. Cindy McCain is on the organization's board. Tonight he is the guest of honor at a reception at the British Embassy where, I'm sure, there will be no shortage of ladies looking to chat up the prince. But it's unlikely anyone will get past his handlers who are determined to erase the memory of last year's Las Vegas trip where he was photographed naked and surrounded by scantily clad beauties while playing poker. This go-round, his itinerary has been tightly scheduled with little time for Harry to go off on his own. Sorry girls. "His schedule is jammed packed with appearances supporting those causes he cares most about. Tomorrow he will visit Arlington National Cemetery to honor soldiers killed in Iraq and Afghanistan. He will also stop at Walter Reed Hospital to meet rehabbing veterans and then fly to Colorado where he will attend the World Warrior Games. He'll then jet back to the east coast where he'll tour the hurricane ravaged sections of New Jersey with Governor Chris Christie and next week on Wednesday he will be coming to my hometown of Greenwich, Connecticut to play polo for charity in front of a by-invitation only crowd of 400. The town can talk of little else. "This is a very serious trip and the intention is to show Harry in the best light possible," said one insider. "He is deeply committed to causes concerning veterans and wants to show his support. He likes to have a good time, but he knows this is something of an image rehab tour and he is determined not to put a foot wrong." The irony is, of course, that the more we see Harry misbehaving, the more we love him. He's not going to be king (that's William's burden to bear), he's single and, perhaps most importantly, he is his mother's son. Here in America we love him for all of that and I suspect in the UK, even if they don't always admit it, they do, too. Stay tuned for Harry updates throughout his trip. Cheerio!